We may make available through the Site or through other websites sample and actual forms, checklists, business documents and legal documents (collectively, “Documents”). All Documents are provided on a non-exclusive license basis only for your personal one-time use for non-commercial purposes, without any right to re-license, sublicense, distribute, assign or transfer such license. Documents are provided for a charge and without any representations or warranties, express or implied, as to their suitability, legal effect, completeness, currentness, accuracy, and/or appropriateness. THE DOCUMENTS ARE PROVIDED “AS IS,” “AS AVAILABLE,” AND WITH “ALL FAULTS,” AND WE AND ANY PROVIDER OF THE DOCUMENTS DISCLAIM ANY WARRANTIES, INCLUDING BUT NOT LIMITED TO THE WARRANTIES OF MERCHANTABILITY AND FITNESS FOR A PARTICULAR PURPOSE. The Documents may be inappropriate for your particular circumstances. Furthermore, state laws may require different or additional provisions to ensure the desired result. You should consult with legal counsel to determine the appropriate legal or business documents necessary for your particular transactions, as the Documents are only samples and may not be applicable to a particular situation. Some Documents are public domain forms or available from public records. You agree to indemnify, defend and hold us and our partners, agents, officers, directors, employees, subcontractors, successors, assigns, third-party suppliers of information and documents, attorneys, advertisers, product and service providers, and affiliates (collectively, “Affiliated Parties”) harmless from any liability, loss, claim and expense, including reasonable attorney’s fees, related to your violation of this Agreement or use of the Site. THE INFORMATION, CONTENT AND DOCUMENTS FROM OR THROUGH THE SITE ARE PROVIDED “AS-IS,” “AS AVAILABLE,” WITH “ALL FAULTS,”, AND ALL WARRANTIES, EXPRESS OR IMPLIED, ARE DISCLAIMED (INCLUDING BUT NOT LIMITED TO THE DISCLAIMER OF ANY IMPLIED WARRANTIES OF MERCHANTABILITY AND FITNESS FOR A PARTICULAR PURPOSE). THE INFORMATION AND SERVICES MAY CONTAIN BUGS, ERRORS, PROBLEMS OR OTHER LIMITATIONS. WE AND OUR AFFILIATED PARTIES HAVE NO LIABILITY WHATSOEVER FOR YOUR USE OF ANY INFORMATION OR SERVICE, EXCEPT AS PROVIDED IN SECTION 17(b). IN PARTICULAR, BUT NOT AS A LIMITATION THEREOF, WE AND OUR AFFILIATED PARTIES ARE NOT LIABLE FOR ANY INDIRECT, SPECIAL, INCIDENTAL OR CONSEQUENTIAL DAMAGES (INCLUDING DAMAGES FOR LOSS OF BUSINESS, LOSS OF PROFITS, LITIGATION, OR THE LIKE), WHETHER BASED ON BREACH OF CONTRACT, BREACH OF WARRANTY, TORT (INCLUDING NEGLIGENCE), PRODUCT LIABILITY OR OTHERWISE, EVEN IF ADVISED OF THE POSSIBILITY OF SUCH DAMAGES. THE NEGATION AND LIMITATION OF DAMAGES SET FORTH ABOVE ARE FUNDAMENTAL ELEMENTS OF THE BASIS OF THE BARGAIN BETWEEN US AND YOU. THIS SITE AND THE PRODUCTS, SERVICES, DOCUMENTS AND INFORMATION PRESENTED WOULD NOT BE PROVIDED WITHOUT SUCH LIMITATIONS. NO ADVICE OR INFORMATION, WHETHER ORAL OR WRITTEN, OBTAINED BY YOU FROM US THROUGH THE SITE OR OTHERWISE SHALL CREATE ANY WARRANTY, REPRESENTATION OR GUARANTEE NOT EXPRESSLY STATED IN THIS AGREEMENT. ALL RESPONSIBILITY OR LIABILITY FOR ANY DAMAGES CAUSED BY VIRUSES CONTAINED WITHIN THE ELECTRONIC FILE CONTAINING A FORM OR DOCUMENT IS DISCLAIMED. The sites displayed as search results or linked to by are developed by people over whom Kosher Organics, LLC, Inc. exercises no control. The search results that appear from Kosher Organics, LLC’s indices are indexed automatically by Kosher Organics, LLC’s automated systems. Kosher Organics, LLC does not screen the sites before including them in the indices from which such automated search results are gathered. A search using may produce search results and links to sites that some people find objectionable, inappropriate, or offensive. We cannot guarantee that a Kosher Organics, LLC search will not locate unintended or objectionable content and assume no responsibility for the content of any site included in any search results or otherwise linked to by the . f.A statement by you, made under penalty of perjury, that the above information in your Notice is accurate and that you are the copyright owner or authorized to act on the copyright owner’s behalf. 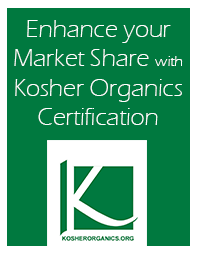 Our Copyright Agent for Notice of claims of copyright infringement on the Site can be reached by directing an e-mail to the Copyright Agent at info@kosherorganics.com. To the extent that you purchase any goods or services directly from us, we will refund you your purchase price if you notify us in writing or via email of your desire for a refund within 3 business days of the sale date, together with the reason for the request. Please note, however, that certain products and services mentioned on our site are sold by third-parties or are linked to third-party websites, and we have no responsibility or liability for those products or services. You may request a refund by contacting us by email at info@kosherorganics.com. You may obtain any additional information concerning our refund and return policy, including our mailing address, by contacting us at info@kosherorganics.com.